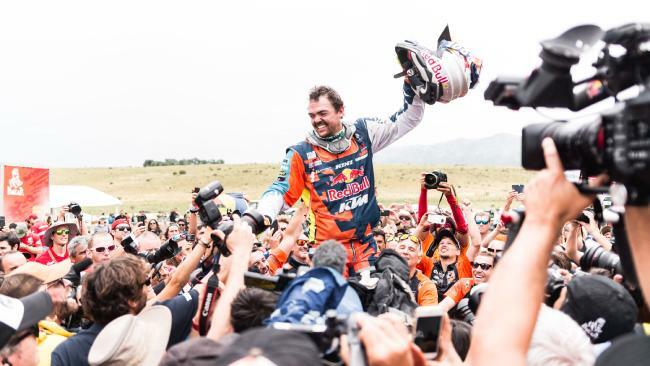 THE Dakar Rally crowned both an old and a new champion at the end of the 2018 edition. Matthias Walkner completed a trouble-free final stage to claim his maiden Dakar victory in the motorcycle class, completing an all-Austrian triumph for KTM and sponsors Red Bull, while Toby Price secured his third podium finish on the rally in third place. Carlos Sainz gave Peugeot the perfect swan song in claiming his second overall win, the Spaniard beating home the factory Toyotas of Nasser Al-Attiyah and Giniel De Villiers by almost quarter of an hour. 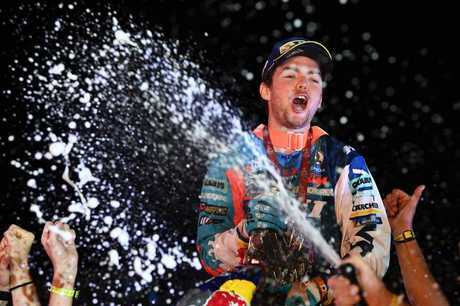 The 14th and final test of what many drivers and riders hailed as the hardest Dakar in years was a 120km competitive section, northwest of the rally's final destination in Cordoba, Argentina. While not as demanding as the treks through the sand dunes or up and over the Andes earlier in the event, navigating the river bed crossings meant it was no cruise to the finish for the competitors - especially given all classes inverted the starting order for the final day. Walkner celebrating on the podium in Cordoba. With an over 20-minute margin Walkner could afford to take it easy through the final test, an eighth place finish enough to secure his first overall victory on the most demanding motorsport event in the world. 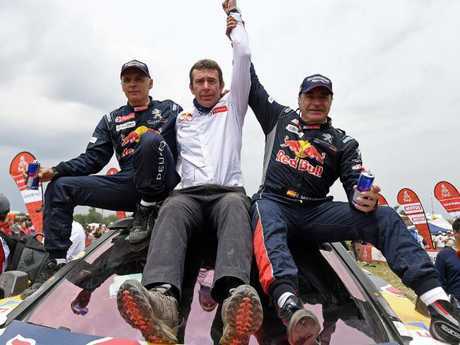 The triumph caps a remarkable comeback from injuries suffered on Dakar two years ago. 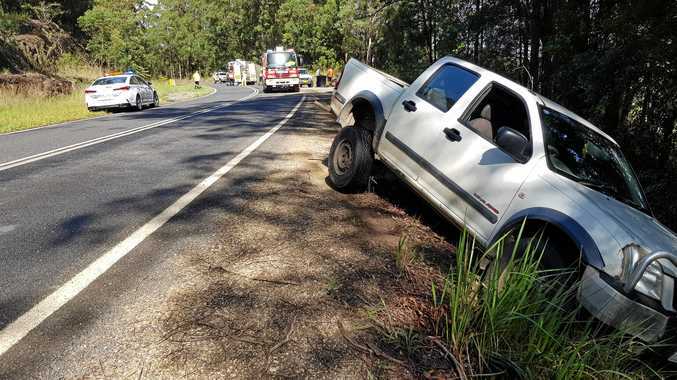 Walkner broke a femur in a heavy crash on the seventh stage of the 2016 event, enduring a gruelling recovery and rehabilitation period to finish second on last year's rally. "It's unbelievable - I can't describe how it feels," Walkner said. "This year's Dakar has been so difficult, easily the toughest rally of my career. Navigation has been tricky pretty much every day. "At the beginning of the race, all the top guys were so close with not much time between us. I just tried to keep on doing well each day without making any mistakes." The pivotal moment came on Stage 10 when every top runner other than Walkner made the wrong navigational call at a river bed crossing, the right decision giving him the lead with a sizeable margin. "After that I aimed to finish each day safely and get to the end of the rally without losing my advantage," he said. "Luckily the tactics worked out and I'm here at the end now as the winner and it feels unreal. Thank you to my team and everyone that has supported me - we did it!" The win is also the 18th in a row for KTM, who has fought off a stern challenge from Honda in the past four editions. The Japanese manufacturer came up 16 minutes and 53 seconds short this year, Kevin Benavides winning the final stage on his native Argentinian soil to secure second outright. It's his first trip to the Dakar podium, Benavides especially jubilant after being hand injury forced him to withdraw just 15 days prior to last year's event. "I feel amazing. This sensation for me is incredible," he said. "To win is my dream so I touched it a little bit. We need to continue pushing and pushing for next year. Now I know I can do it, so I'll continue preparing and try to do it." 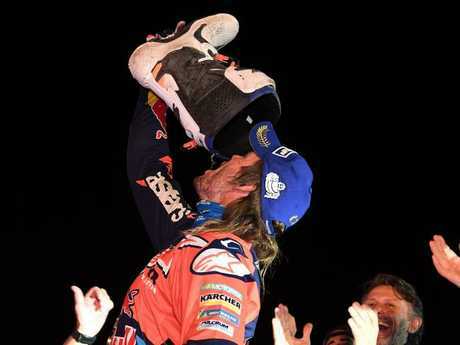 Toby Price does a shoey to celebrate the end of Dakar. Price set his sights on trying to secure a KTM 1-2 on the final stage, but the route proved not conducive to clawing back his five minute deficit on Benavides. "I tried to push today to make up the time on Kevin but halfway through I knew five minutes was just too much and so I just aimed for a safe finish," Price said. "To finish the Dakar is an achievement in itself, to come away at the end of this year's race with a podium is unbelievable, especially after the year I've had." All three Australians will return home as finishers of the 2018 event, with Rodney Faggotter and debutant Scott Britnell both making it to the end of the final stage in Cordoba. Faggotter was the last man standing in the Yamaha factory squad, his three teammates felled by crashes and injuries. The Queenslander's 16th-place finish marks his second finish on the event. "The race is over and I'm happy I crossed the finish line," he said. "It's been a long two weeks of racing and I'm happy to be here at the finish line. This has been a demanding Dakar so to reach the finish is a feat in itself. I really had a great time racing with the team here in South America." 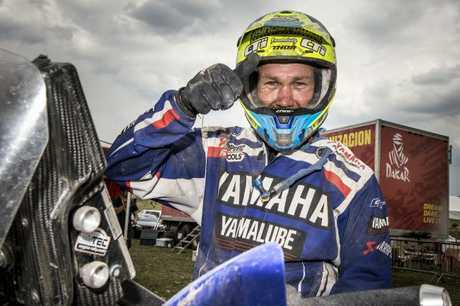 Britnell completed his first Dakar in the assistance-free Malle Moto class in a commendable 61st place. Of the 139 riders in the motorcycle class when the rally began in Peru 15 days ago, just 85 made it to the finish line in Argentina. Sainz (R) with Peugeot team boss Bruno Famin (C) and co-driver Lucas Cruz. Peugeot once again leave Dakar as winners, Sainz securing his second triumph with a steady drive to ninth place on the final test. The event had been cruel to the WRC legend in recent years, crashes and car problems meaning El Matador's last finish came back in 2011. Peugeot's four-car challenge was picked off one by one as the event went on; first early leader Cyril Despres losing time after hitting a rock on Stage 4, then Sebastien Loeb forced to quit on Stage 5 with an injury to co-driver Daniel Elena. When Stephane Peterhansel's hopes came undone on Stage 7, that left Sainz in the lead with a comfortable margin but in an uncomfortable position; Peugeot's hopes rested on his shoulders alone, and the victory was his to throw away. 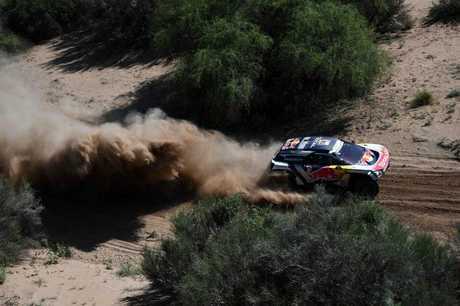 Sainz and Cruz won two stages on the 2018 event. Sainz drew on all his experience and drove the second half of the rally with his head. 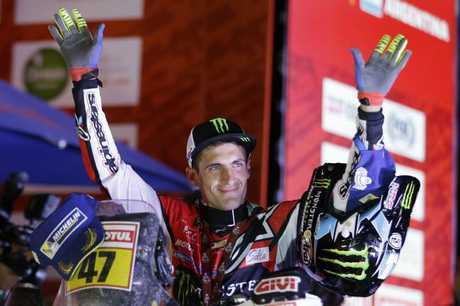 Although a controversial clash with a quad rider drew him a 10 minute penalty which was later lifted on appeal, the Spaniard had a largely trouble-free run to the podium in Cordoba - but it was hardly easy. "I'm so, so happy, after four years when we joined forces with Peugeot to make a dual-drive winning car," Sainz said. "It's probably been the most difficult Dakar that I've ever taken part in, even counting the ones in Africa. The organisers gave us a truly challenging route, with so many incredibly difficult stages. "Even the two stages right before the finish were unbelievable and Peru was also very tricky. "Of course, it's very satisfying for Lucas (Cruz, co-driver) and me to win such a difficult rally. And the same applies to the whole Peugeot team, which has done a fantastic job throughout the entire programme. "I don't know if I'll be back next year. Now I have to enjoy this victory, go back home, speak with my wife, with my family and then we will see." Al-Attiyah took four stage wins on the 2018 event. 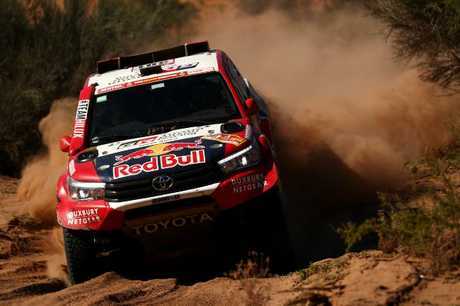 The final stage win fell to Toyota, De Villiers beating home Peterhansel by 40 seconds to retain his hold on third place overall behind teammate Nasser Al-Attiyah. As with Honda in the motorcycle class, Toyota has been either luckless, outgunned, or both in its attempts to win in the past few years. Its latest iteration of Hilux unable to match the pace of the Peugeots in the early stages, while punctures and mechanical dramas put paid to any hope of either Al-Attiyah or De Villiers being close enough to put Sainz under pressure in the closing stages. "It was a crazy Dakar but we love the Dakar and would like to thank the organisers for everything, for making this a really hard Dakar. Every day the result was changing," Al-Attiyah said. "We've reached the final day in second place - I think it's not bad with all the problems we got in the first week. "I was thinking that we wouldn't be on the podium after losing one hour and fifteen minutes, but okay, we are quite happy to be here and second place is not bad, I believe. "I remember in 2010 I was second behind Sainz, now in 2018 we finish behind him also, but I will do my best for next year to win the Dakar. Next year, we absolutely can win." The Minis also fell victim to crashes or mechanical issues, leading contenders Bryce Menzies and Nani Roma crashing out in the early days. Of the 92 cars that took the start of the rally in Lima, just 43 made it to the finish in Cordoba.